"Each of them in their own way has a sort of crisis. In Renoir's case, it is the sense that he doesn't know how to draw, that he didn't know anything, that he has to go back to basics. And Pissarro experimented with a different type of technique [pointillism]. In some ways, each of the artists is looking at this language that was so radical and finding it is in some ways, lacking." If 19th-century artists were still enslaved by academic, historical art, the Impressionists, led by Monet as their "Moses," were the rebellious forefront, finding "strength in numbers." But just as the Hebrews were made to wander the desert for two generations until all those born in slavery were gone, perhaps the most important aspect of Impressionism is the trail they blazed into modernity for those who would follow—the Post-Impressionists, the Fauvres and so on—who would creatively flourish in the Land of Milk and Honey. A&E has created a majestic visual document on Impressionism in two parts: The Road to Impressionism and Capturing the Moment. Featuring the best known and beloved painters—Claude Monet, Edgar Degas and Pierre-Auguste Renoir—they include, on equal footing, two of the oft-omitted core members, Camille Pissarro and Berthe Morisot. In its 200 minutes, they also devote time to those painters on the periphery of the group: Frederic Bazille, Gustave Caillebotte (a favorite of mine), the American Mary Cassatt, Paul Cézanne, Alfred Sisley and the movement's initial supporter, Édouard Manet. Over a background of paintings, period tableaux, photos and archive film of the artists and their time, the vast legacy of these talented, rebellious men and women unfolds in a carefully constructed format. As intrinsically different as these painters were from each other, and despite their diverse backgrounds (Degas came from wealth and basically enjoyed the lifelong support of his family, where Monet's father gave and withdrew support sporadically; Morisot broke rank with her social class to paint professionally, although publicly called it "a hobby," and so on) they managed to work together, encourage and support each other. Their achievements include the elevation of the simplest, contemporary activities to modern masterworks as well as the style and technique used to capture them. The program easily guides us along their individual paths as they moved through each other's lives. 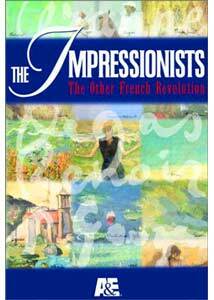 It presents the usual strives and woes in their struggle toward ultimate success in their own lifetimes; it is in this latter period they each created the best of their œuvre, with the exception of the ailing Renoir. While many familiar works fill the screen in the course of this 3-hour survey, it is the lesser-known pieces that perhaps attract most. The painting that most surprised me is found at 23m:15s on Disc 2: Monet's 1877 Turkeys at Montgeron. Light from the bright, cloud-filled sky, seen through a break in the dark trees, spills across the front of the Hoschedè's chateau, along the far lawn and onto a group of white turkeys that have gathered in the shadow cast by a nearby tree in the foreground. A distinct flow of light and shadow, simply stunning. There is a plentitude of works displayed to please well-studied admirers and newcomers alike. While covering some well-worn tracks, this documentary delights with numerous revelations, especially in the material pertaining to their declining years. Many of Pissarro's later works were composed from an extreme perspective, above the busy streets of Paris: As a Jew, he could barely venture outside during the infamous Dreyfus Affair of the mid-1890s. Confined to the view from his rooms, he never stopped painting and in the galleries, his work was more popular than ever. His lifelong friend, Degas, became a vehement anti-Semite, caught in the frenzy of the time. Steadily growing deaf and blind, Degas gave up art in 1912 and ended his days walking the streets of Paris. At one point, Renoir recognized his own limitations: "I've gone to the end of Impressionism, and I have reached the conclusion that I do not know how to paint or draw." (I agree.) Morisot, who had married Manet's brother, was only 54 when she died of pneumonia. Monet stopped working for an entire year after his second wife, Alice, died in 1911, but continued again until his own death in 1926, long after the next generation of reductionists had moved on to the "promised land." Image Transfer Review: The full-frame image is gorgeous, an easy transfer from this recent cable television production. To my knowledge, colors are accurate and the artwork well represented. Vintage footage has its usual problems, but this is generally accepted as part of the charm of such insertions; I was amazed at how much archive material was available for this era. The production team was meticulous and creative in framing beautiful visuals to hold viewer interest and the transfer does this justice throughout, with no obvious blemishes. Audio Transfer Review: Despite many sources, this Dolby stereo track is even and discernable beginning to end. Ambient music never overpowers, and all dialogue is clear and level; perfectly suited to the material. Extras Review: A&E have prepared an interactive timeline that spans the years presented on each disc: Volume One begins with Pissarro's birth in 1830 and goes through 1872, the year the term "Impressionism" was first used. Volume Two begins in 1873 and leaves us at Monet's death in 1926. Each stop on the timeline fills the background with a representative image, making for a more interesting and useful presentation. Each disc features a different mislabeled "photo" gallery, actually a series of reproductions of the various artists' work. While this is exactly the sort of supplement one would hope for on such a release, I am extremely disappointed with its design and presentation. Each image is "framed" by an ugly, distracting, gold-patterned border with the title across the bottom on a simulated brass plaque (including the simulated brass screws to hold it). There is so much extraneous clutter that the images are allowed 50% or less of the screen real estate. The edges of the "frames" flicker as well, rendering the small reproductions that much more difficult to enjoy. It is, however, nice that A&E includes the work of a few artists outside the immediate group: Gustave Caillebotte, Paul Gauguin, Mary Cassatt, George-Pierre Seurat and Paul Cézanne. For some reason, no paintings by Morisot appear in the gallery on Volume Two. The menus and packaging are less than impressive; surely something more creative could have been devised. Insufficient chaptering and the lack of subtitles are disappointing as well. I am compelled to note that while Morisot is mentioned in the notes on the outer box, her name is omitted from the notes on both back covers of the individual keepcases. An unfortunate oversite. While not everything one could hope for, I do note this is more than is usually included with the average documentary, and therefore welcome indeed. The grade reflects an appreciation for the rare attempt to provide anything to supplement a documentary in this genre, but is also lowered due to the unsatisfactory presentation of the gallery. A&E's ambitious presentation, The Impressionists: The Other French Revolution, is a feast for the eyes, and while not a definitive analysis (can this be done? ), it is a comprehensive survey, creating as subtle and finely-detailed a view of the movement as any work the artists, themselves, created. A fine program for students as well as those familiar with these French masters, enthusiastically recommended.